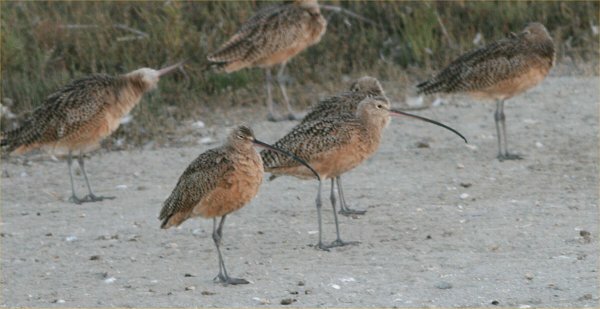 Upper Newport Bay has a sterling reputation as a locus for some of the best coastal Orange County birding around. This is a big deal, considering both the outstanding avifauna this part of California can deliver as well as the other superlative sites along this stretch of the Pacific. Unfortunately, my first taste of the Back Bay, as it’s often called, was a bit bitter due to the deleterious influence of the Santa Ana winds. An ecosystem as exquisite as the Upper Newport Bay Nature Preserve and Ecological Reserve demands repeated visits. Thanks to Amy’s quick thinking, we managed to fit in an early morning excursion before my business commitments killed any more birding. Meeting before dawn, Amy and I made one misguided stab at birding the area around the Back Bay Science Center before hightailing it to the traditional Upper Newport Bay staging area. At least we picked up Yellow-crowned Night-Heron! The expanding light and diminished wind set the stage for just the kind of euphoria-inducing avian tableau California is known for. Mere feet from the parking lot flocked multitudes of shorebirds. 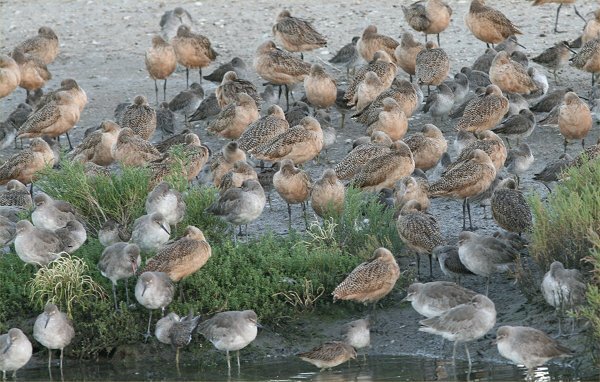 The species were aesthetically stratified: first, a layer of dun colored dowitchers working the shallows, followed by a layer of ash gray Willets behind, which were in turn backed up by dappled tan Marbled Godwits brandishing wicked upturned pink and black bills. The still waters of the bay also harbored, among other birds, Forster’s Terns, Western Gulls, Brown Pelicans, Double-crested Cormorants, Pied-billed Grebes, American Coots, and Snowy, Great, and Great Blue herons and egrets. The duck mix was heavy on Mallard and American Wigeon but also included Northern Pintail and Ruddy Duck. The raptors were mostly harriers, vultures, and red-tails. I was really loving scanning those shorebirds as wave after wave flew in to join the flock. Things became even better when a flock of what I assumed were more godwits resolved into about seven Long-billed Curlew brandishing truly improbable proboscises. I don’t know what it is about Amy but she seems to be a magnet for those crazy curlews. What else could explain the fact that I’ve only even seen Long-billed Curlews with her? The horde of shorebirds, while not particularly diverse, held our attention for a while, especially when a squadron of Black Skimmers squawked their way into the flock. However, I was really after passerines and the only ones we were spotting along the water were Song Sparrows and Black Phoebes. With time rapidly waning, we checked out the inland trails. Of course we found plenty of phoebes and sparrows there as well. We also saw lots and lots of House Finches and Yellow-rumped Warblers. In fact, those four species comprised nearly all our songbird sightings. The notable exceptions included White-crowned Sparrow, California Towhee, and Bushtit, the latter aggregating in adorable flocks. Not included in that list, obviously, was my target species of California Gnatcatcher. We were in the right place at the right time, but simply couldn’t bring in the bird. I’m happy to say, though, that I left with a lifer anyway. This portion of the coast, I found, was hopping with hummingbirds. Alongside the ubiquitous Anna’s were waves of frenetic Allen’s Hummingbirds. I happily racked up my first, second, and third views before I stopped counting! And while we’re on the subject of Amy being a magnet for certain birds, she certainly attracted a surly song sparrow. 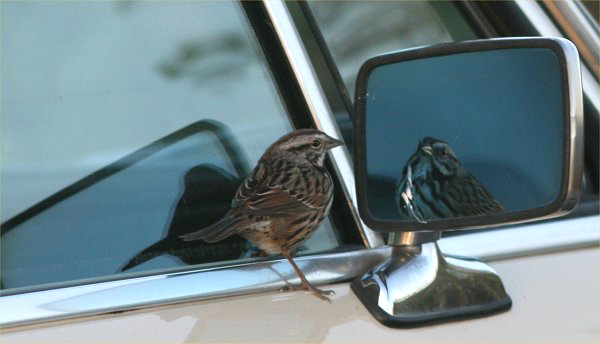 This pugnacious passerine spent at least a half an hour savaging the side view mirror on Amy’s vehicle. Check out Amy’s own account of our morning to see how badly this bird despoiled her glass. My tale of Upper Newport Bay birding would seem to end there considering how busy I’d be for the rest of my stay. But you’d do well never to underestimate my commitment to exploring a new ecosystem, especially one as idyllic as Newport Beach. If I’m going to lug bins and a camera across North America, I sure as shooting am going to use them. So, if you want to discover whether I was successful in chasing down any of my target OC avifauna, come back in a couple of days for my final installment of Upper Newport Bay birding reportage. Sounds like a good day birding to me. I haven’t been to Newport Bay but it reminds me of Morro Bay where I birded a couple weeks ago. Just RICH with life. Wow! Yellow-crowned Night Heron is a really, really fantastic bird for Orange County and California (there’s only one tiny breeding colony in San Diego County). It’s on the California review list. If you haven’t, you should write up some documentation and send it in to the CBRC. I wish I had known that, Jon. I didn’t take any record shots of the bird. While Amy and I both looked at the bird and agreed on its identity, it was partially obscured and far away. I’m not sure I’m willing to stake the integrity of the Orange County species list on this sighting! All that, in just 1.5 hours. That SOSP shot makes me smile. Looking forward to your next post!